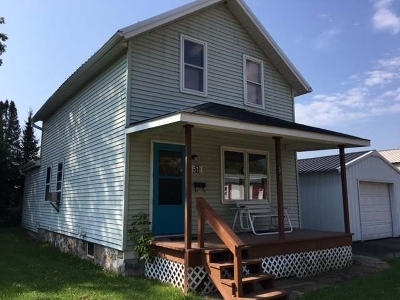 Priced below appraised value.Cute 2 story home close to downtown Mattoon. Walk up the covered front deck into the first floor which contains good size living room/dining area with ceiling fans and a window air conditioner included. First floor laundry area includes washer and dryer and newly remodeled full bathroom with shower. Eat in kitchen has updated cabinets, refrigerator, gas stove and dishwasher. 2nd floor has 2 bedrooms. 1 bedroom has an attached updated half bath, closet space and shelving. 2nd bedroom has built in twin beds, with drawers and cabinet and walk in closet. There is a back porch that leads to the basement. Newer windows throughout the house, new vinyl siding, metal roof over main part of home. A 25x17 metal garage with garage door opener and electricity. Black top driveway and additional parking in the front. The back yard has fencing on the south side. Furnace is approx 10 yrs old, Hot water heater 40 gal approx 8 yrs old.Plumbing/electric also have some updates.